I missed Mankantha when I was in Chennai due to limited time and sold-out shows in my usual cinemas – which I guess was a good indication that the film would be worth seeing. Venkat Prabhu’s fourth film does feature his usual crowd of young actors, but also stars Ajith Kumar in his fiftieth film – it’s all about the numbers! 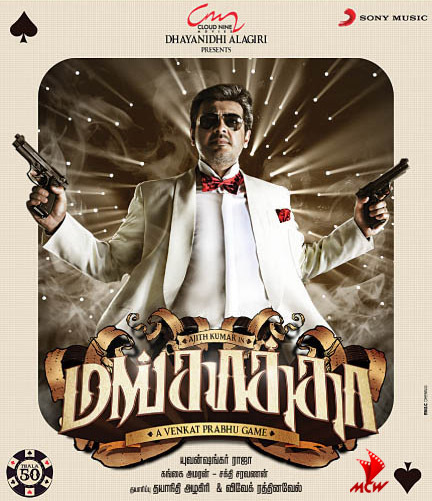 Mankatha is an action thriller based around the theft of illegal gambling money and features so many twists and turns that at times it’s hard to keep up with just who’s double-crossing who. Although there are a few leaps of faith required to fully engage with the plot, overall the pace of the action and an excellent performance from Ajith in a negative role make the film well worth a watch. 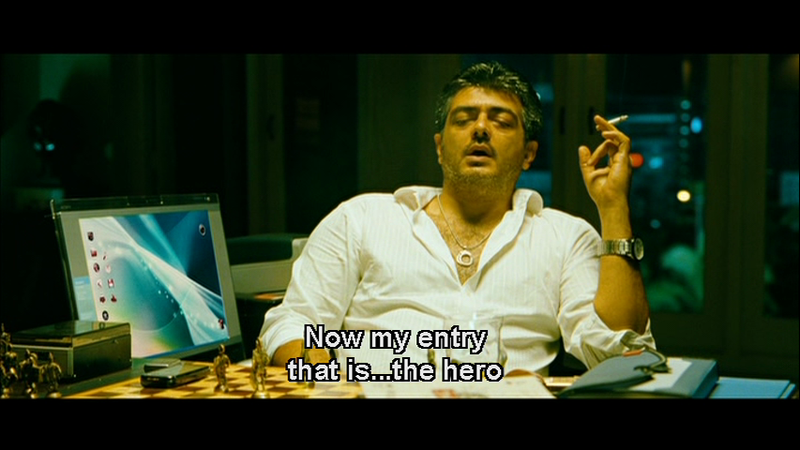 The story starts with Ajith as Police Officer Vinayak Mahadevan, landing onto the screen in a typical Tamil Hero entrance style (i.e. unlikely appearance from out of nowhere) to prevent what appears to be a corrupt police execution of smuggler Faizal (Aravind Akash). The lines are blurred right from the start – is Vinayak a hero, fighting corruption and gambling despite being suspended from duty for saving Faizal, or does his drunkenness and casual infidelity point to even bigger character flaws and a tendency to flout the rules for his own benefit? Each subsequent scene makes the conundrum more difficult to solve, and this ambiguity runs throughout the action in the first half. 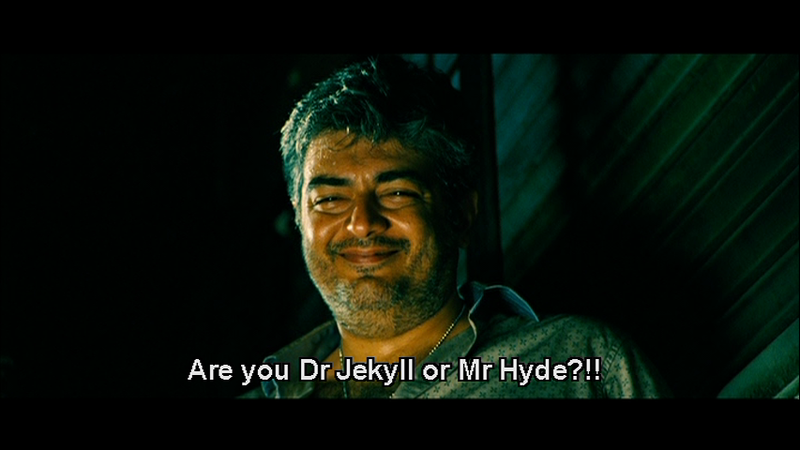 It’s not until much later in the film that Vinayak’s true character becomes apparent (or does it?) and his real motives are revealed. 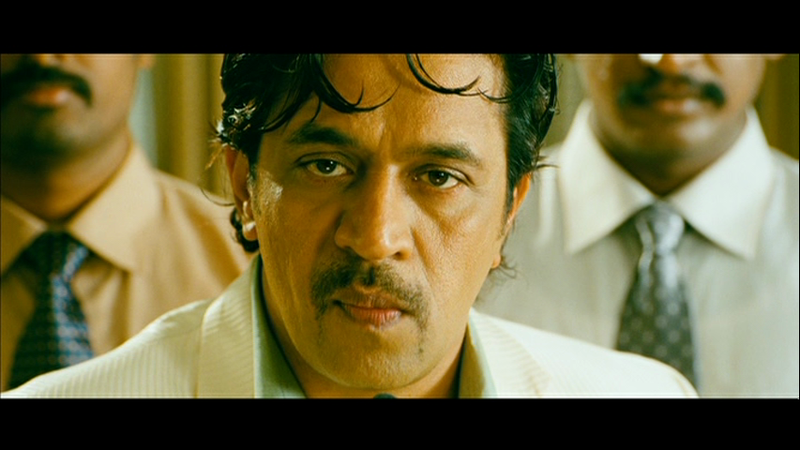 Then there is ‘Action King’ Arjun, who appears as Prithviraj, the head of a special task force entrusted with stamping out illegal gambling on cricket matches after the head of the anti-corruption squad Kamal Ekambaram (Subbu Panchu) commits suicide due to his own gambling debt. However Kamal isn’t dead, but instead reappears as one of the investigative team, a detail which I kept expecting to have some relevance, but it never actually does. Arjun is very OTT in his action scenes, made even funnier by his terrible floppy hair, but otherwise delivers a generally straitlaced and relatively heroic portrayal of a senior police officer intent on stamping out gambling. Vinayak, one night stands aside, is in a relationship with Sanjana (Trisha), the daughter of Arumuha Chettiyar (Jayaprakash). Chettiyar runs the illegal gambling network in Mumbai along with various other illegal activities, and he also just happens to be the man who employs Faizal. 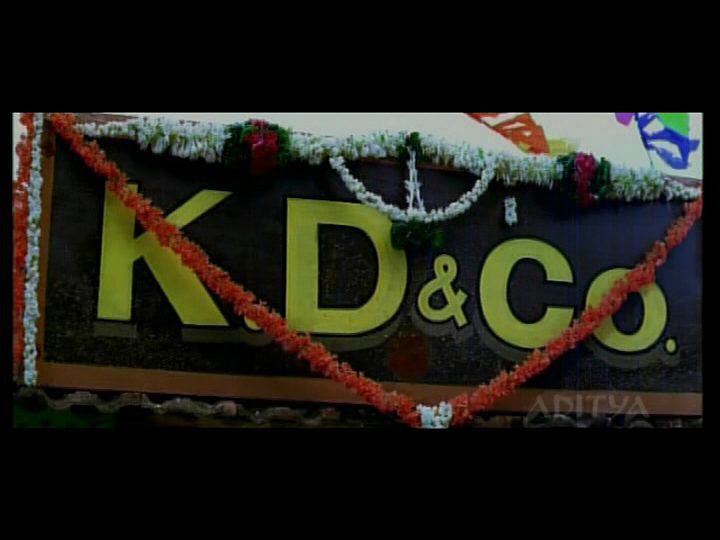 Was this good planning by Vinayak, or just a coincidence? 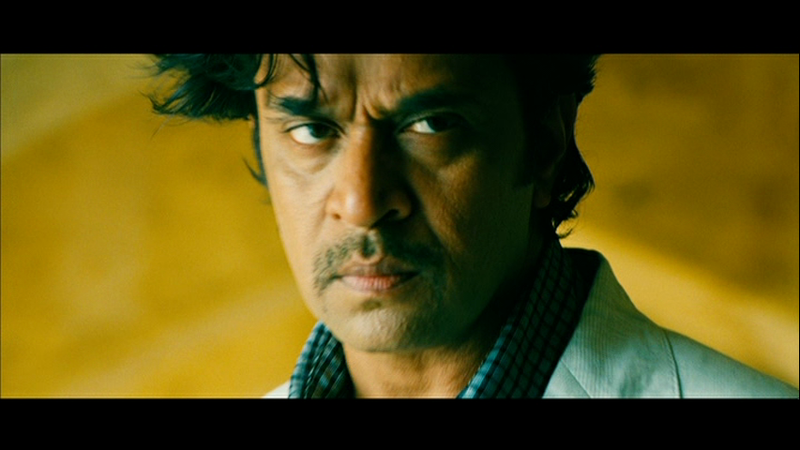 Since Vinayak apparently turns a blind eye to Chettiyar’s illegal activities the question then follows, is this all part of an undercover plan to infiltrate the gang and bring down Chettiyar or does Vinayak really not care about his potential father-in-law breaking the law beyond the opportunity to pocket a few bribes? 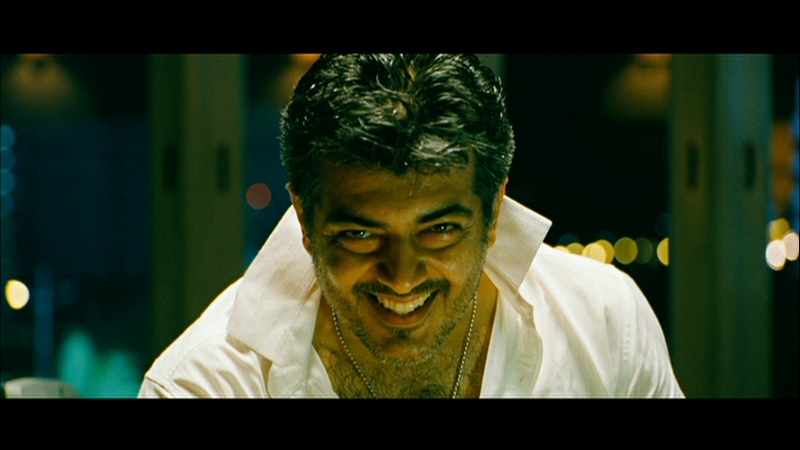 It’s hard to tell, as Ajith makes the most of his devastatingly cheeky grin and ever more crazy persona to keep everyone guessing his true motives. Meanwhile, Chettiyar’s henchman Sumanth (Vaibhav) is in cahoots with local Sub-Inspector Ganesh (Ashwin Kakumanu) and bar-owner Mahat (Mahat Raghavendra) to steal the gambling take from the IPL final. 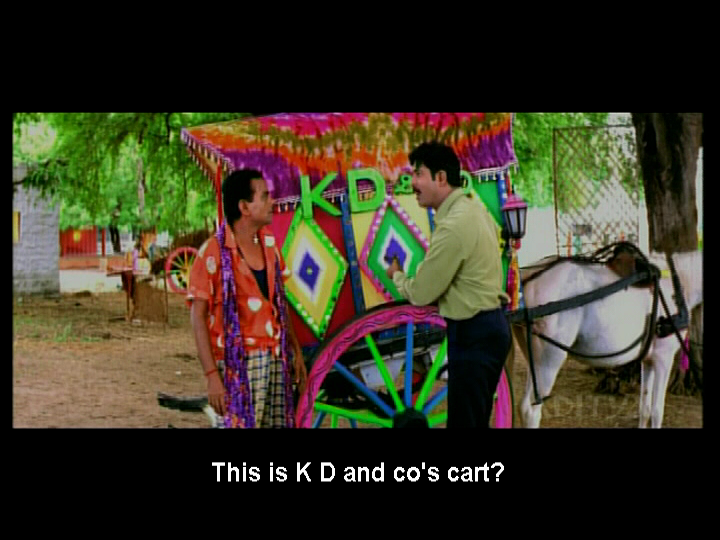 Mahat ropes in his friend from home Prem (Premji Amaren) who just happens to be an IT expert as well as a terminal idiot. A little of Premji’s humour here goes a long way and less really would have been better, but cleverly developed group dynamics and good performances from the rest of the gang help keep the story on track. In due course, Vinayak finds out about the plot which just happens to coincide with his own plans to loot the money, and the conspirators end up joining together to steal $5 billion in US dollars. While some of the heist details require a major suspension of disbelief, the rest of the story deviously pits everyone against each other with betrayals, plot twists and unexpected revelations, which mean it’s necessary to concentrate and pay attention to work out just who is allied with who at any given time. While the guys get all of the action and pretty much all of the storyline, there is very little for Trisha and the other female characters to do. Anjali has perhaps the next most realised role as Sumanth’s wife, but her only value is as a bargaining tool later in the story. Andrea as Prithviraj’s wife and Lakshmi Rai have even less of a role, and almost all of the female roles could have been eliminated without making any real ripple in the story. The songs are also mainly superfluous although the soundtrack by Yuvan Shankar Raja does have a few memorable tracks. 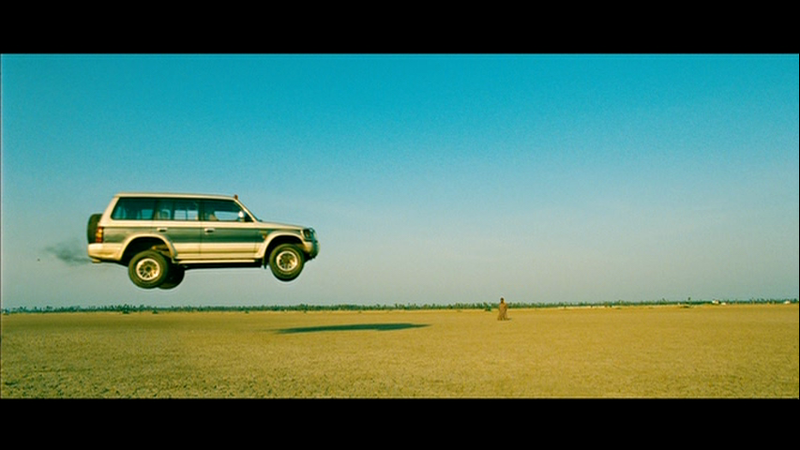 This is probably the best choreographed, although the visual effects for Vaada Bin Laada are worth a look too (watch out for the plane on the wall that takes flight). 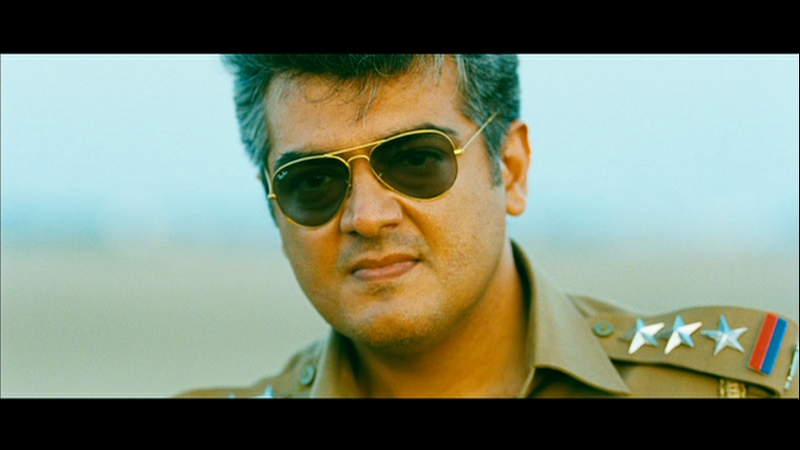 Ajith is definitely the star of the show in a negative role that must have been a hoot to play. He spits venomous lines with great joie de vivre, throws in plenty of bleeped out profanity and his crazed megalomania is wonderful to behold. He has great chemistry with Arjun and the two take control of every scene they are in. However Vaibhav is also notable and the other cast members all provide solid performances. While the focus is on the action there is also some nifty camera work from Sakthi Saravanan, including a great shot of some boys playing cricket in the slums while Vinayak chases down Sumanth. 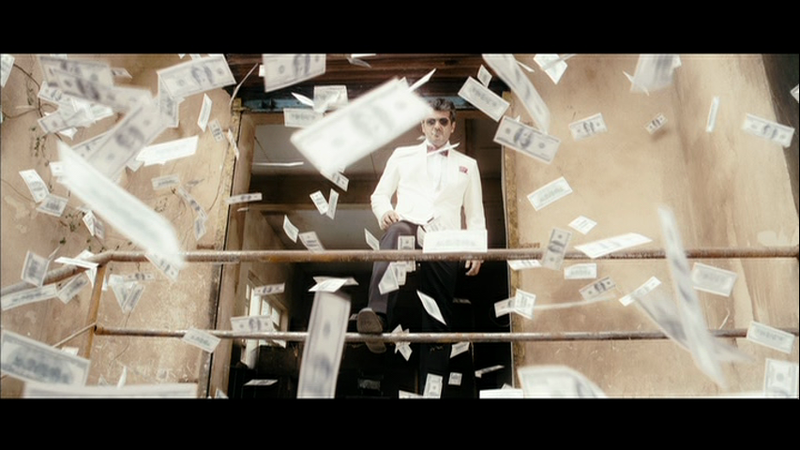 Mankatha is not the most convincing heist film, and it would definitely benefit from trimming some of the excess in the form of unnecessary songs and peripheral characters, but it succeeds in entertaining which after all is the main purpose of cinema. I loved the twists and turns and appreciated Ajith’s excellent demonstration of just how to keep everyone guessing while Arjun tries his best to convince everyone that he is the hero. It’s amusing and doesn’t take itself too seriously which makes for an enjoyable watch. 3 ½ stars.